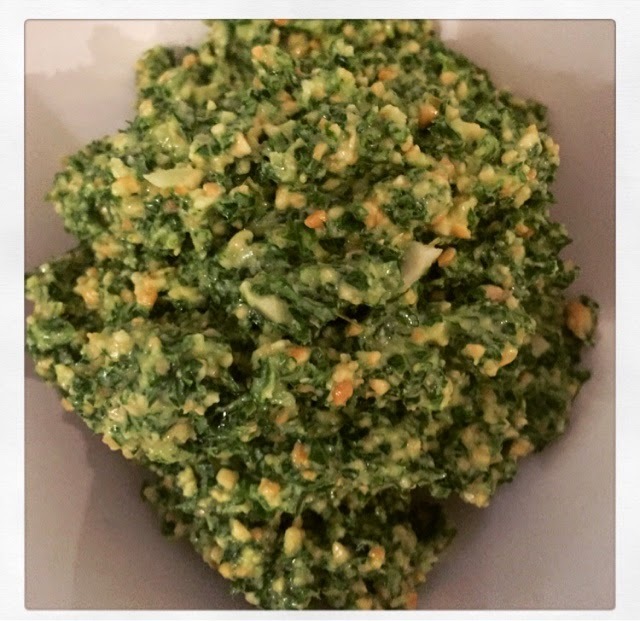 With an excess of kale in the fridge, the kids had already indulged in kale chips, the idea of kale pesto was the next step. Kale contains high levels of iron and calcium, it's also high in Vitamin K which helps prevent cancer and Alzheimer's; Vitamin A for vision and skin; and Vitamin C for your immune system and metabolism. What person wouldn't be eating this super food in it's own right. I do love the classic flavour of basil in pesto and using a combination of both basil and kale means you still get that beautiful basil flavour, with all the nutritional benefits of the kale. You'll find that the pesto tastes so fresh and after a day in the fridge, it doesn't turn that dull colour when you make the usual basil pesto. What's so great about this recipe is that you can mix and match the ingredients so easily. Don't like basil? Try parsley, coriander or spring onions. Run out of kale? Use spinach, rocket, or even silver beet leaves instead. Let me know what other combinations you come up with. 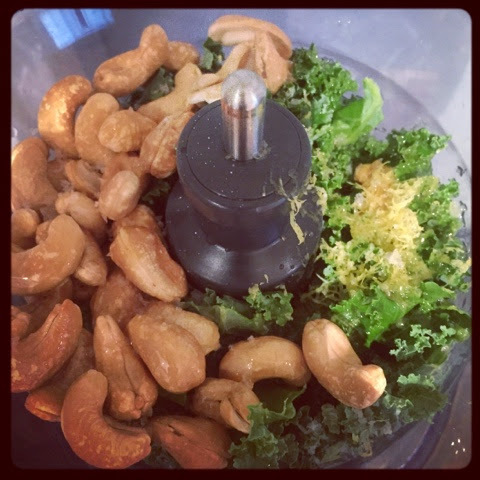 Blend all ingredients in a food processor until well combined but still with some texture. This pesto will last around 3-4 days in the fridge. You can also freeze it, if you don't plan to use it all in one go.This recipe also easily doubles or triples for a larger crowd. If short on time, this pesto is the best snack. Toast up a slice of bread and slather the pesto on top. Yum yum! 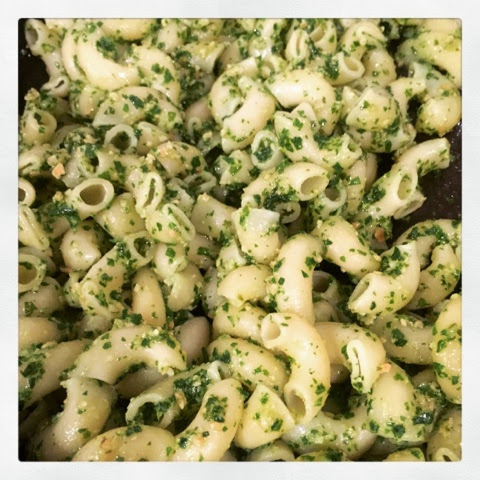 Cook up some macaroni, add a generous dollop of the kale cashew pesto and mix through until warmed. The kids will devour this delicious meal, my munchkins loved it. 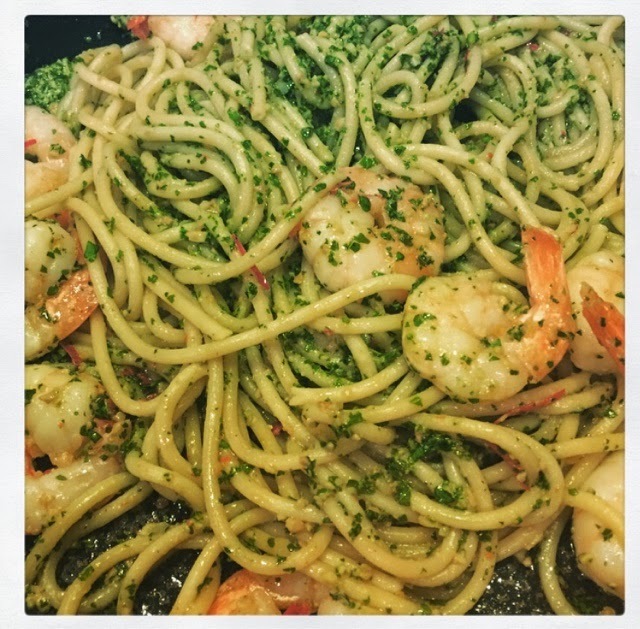 An adult version is to cook up some spaghetti, fry up some chilli and prawn (frozen or green prawns work fine) and add this to the spaghetti with a generous dollop of kale cashew pesto. Mix through until warmed and served up with freshly cracked pepper on top. Yum.